The holidays are supposed to be the most wonderful time of year, but for many Americans, they’re also the most stressful. For more than a quarter of Americans, the biggest source of that stress is shopping, according to a new study by cash back shopping site Splender. Other top stressors included working during the holidays (16 percent), and cleaning and decorating (12 percent). Perhaps Americans are so stressed about shopping because they have so much trouble selecting the right present. 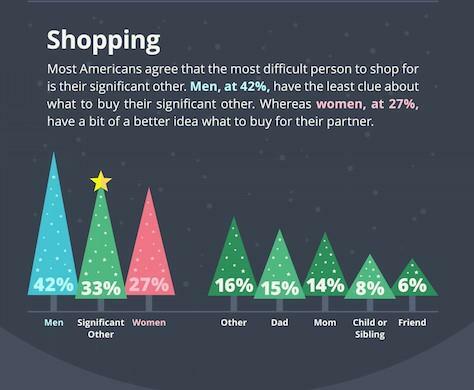 Those surveyed said that their significant other was the hardest person to shop for, with men more likely (42 percent) to agree with that statement than women (27 percent). Receiving gifts from loved ones is apparently no picnic either. Among those surveyed, 16 percent cited their significant other as the person “who most often disappoints you in their gift choice,” making it the most popular response. Respondents also admitted to being disappointed by gifts from siblings, parents, friends and grandparents. Not everyone keeps disappointing gifts, though. More than 40 percent of those surveyed say that they re-gift presents, with women more likely to do so than men, and gift returns were also popular. Half of those surveyed said that they would return clothing and shoes, 12 percent said they’d take back sports and recreational equipment, and 11 percent said they’d return jewelry or watches. This year, the typical shopper plans to spend more than $1,100, according to PwC. That’s a 10 percent increase over last year and the highest level since the Great Recession.